We recommend that you make a pros/cons list. In case that sounds a little bit “high school” for you, we’ll call it a Cost-Benefit Analysis. You’re likely diving into this FSBO thing for a number of reasons. There’s a pretty good chance that one of those reasons is saving yourself some money. (Hey, even if that wasn’t one of your reasons, everyone could use a little extra cash in their pockets, right?) Before you go full throttle on FSBO, dig into all the costs of listing, marketing, and transacting your home on your own. Weigh these things in addition to all the risks. You’ll need that pros/cons list (or “Cost-Benefit Analysis” for all the fancypants out there…) in order to ensure that the benefits (cost savings) outweigh the costs, namely the opportunity cost and risk. The spectrum of home selling options is vast. There are plenty of ways to sell a home between FSBO and a Full-Service, 6%-commission-based agent. From Flat Fee MLS services that charge a few hundred dollars, to new services such as Jovio, there are many options for home sellers that won’t break your bank (or your sanity). Cost-Benefit Analysis -- do the benefits outweigh the costs? What’s the next best option to FSBO? Have you weighed this option directly against FSBO? Determine your selling goals. Will selling FSBO achieve those goals? Take a look out your front window. See that house across the street? THAT’S your competition. The house next door? Also your competition. How does your home compare? For better or for worse, your home will be judged, especially if there are many other options on the table to choose from. Besides what’s happening on your block, do you know what’s happening in your local real estate market? Is it a buyer’s market or a seller’s market? Is it a balanced market? More so, you should know all the current market conditions AND the superior listing-price strategy. Knowing the right time to sell is the key to a successful FSBO. Once you’ve assessed the market thoroughly and understand what other options prospective buyers have, it’s time for home improvement. Your home needs to be competitive and, depending on the type of market you’re entering, repairs can be minimal or plentiful. It all goes back to understanding the market, being aware of local buyers’ preferences, and knowing your competition! Last but not least, remember your goals! Are your expectations for selling FSBO realistic? Would you prefer a quicker sale with less foot traffic, or do you just want top dollar? These are the competing needs you must sort through and prioritize. Buyer’s, Seller’s, or Balanced Market? How does your home compete against others on the market? It’s time for your home to shine. Have you taken the proper steps to prep it? De-personalize: Personalization should be long gone by the time your property is listed. Leave the space just full enough so that potential buyers can visualize living there with their own furniture. Remove family portraits and replace them with neutral art or photography. Then again, family portraits are better than just the nail and the wall, so if you can’t easily replace these photos with something else, leave ‘em up! Deep Clean: Carpets, floors, windows, tiles - give it the full shakedown from top to bottom, left to right. Sure, this all might be obvious, but don’t be the seller who overlooks this, and then wonders why their property isn’t selling. If you follow these three D’s, your property will be looking it’s absolute best. Then, you’ll need to determine if staging makes sense for your property. This step can be subjective, but, of course, there are also common practices. For example, take a look at large luxury properties vs regular condos. With larger, luxury properties, staging is worth every penny spent because it fills up the large space and accents the architectural design of the property. With vacant condos, digital staging works best because it is highly customizable and saves money. There are resources out there for both staging options, so utilize these as you see fit to market your property in the best way possible. One place you should never cut costs is the marketing and photography for your listing. When you’re selling FSBO, you need to go above and beyond to catch the eye of prospective buyers and buyers’ agents. Who doesn’t love some good old fashioned manual data entry?! We know this isn’t the most fun, but is it the most effective? YES, especially when you go FSBO. See, the ultimate marketing goal when you sell FSBO (besides selling your home, of course) is covering as much ground as possible, which includes the grounds of the internet. There will be a lot of different interfaces you need to interact with, and while they can be repetitive and annoying, the work you put in will pay off in the long run. So, where exactly is EVERYWHERE? 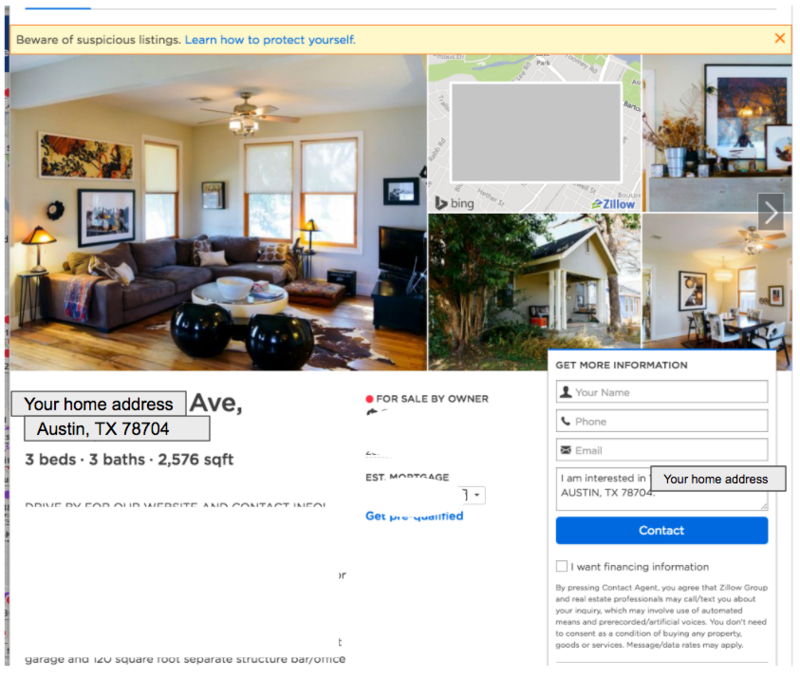 The order your photos appear on Zillow WILL matter. Think like a home buyer searching for a new home. What photo would catch your interest? If you want more views, optimize your photo order! Don’t just write a description, transport the buyer into your home (No, not physically! Through your vocabulary). Break out those poetry skills from sixth grade and use some adjectives to really make a prospective buyer feel like they’re experiencing the home--make it irresistible to get them in the door. You’ll want to tell them what they don’t know yet--your headline is “3 bedrooms and 2 baths,” so don’t waste precious character count in the description on that. Zillow has a section where sellers can call out what’s best about their property, so take advantage of that to prominently highlight your favorite features. Professional photography and super description are equally important... But do you know what’s better than 1,000 words and 1 photo? A video. Zillow allows you to upload video walkthroughs! What better way to digitally transport prospective buyers to your home than show a video of it? Make sure ALL the features of your property have been added here. House hunters have very specific alerts set on their phones and computers that notify them of newly listed homes that have their desired features. Be specific so you can cater to specific alerts and quickly present your property to the right potential buyers. Also, keep in mind buyers’ search-price parameters. This means that it’s better to price at $150,00 rather than $149,999 since the $149,999 mark will be filtered out and bypass interested prospective buyers. However, it takes more than just Zillow to be a successful FSBO--you’ll need to list your property in a slew of locations. Craigslist - This old-school method has aged well seeing as how people are still using Craigslist every day to buy and sell just about anything--including houses. Because of its street cred, Craigslist is a great tool to attract TONS of traffic. Facebook: Groups & Marketplace - Facebook Groups that have a local “theme” can be a great way to spread the word about your property being on the market. Facebook Marketplace is another great tool for listing a property. There are over 400 million Facebook users in buy and sell groups, so don’t miss the opportunity to utilize this as a platform to market your property. Any local website or medium - Back to that word of mouth thing… Telling your friends and neighbors about your listing can do wonders for attracting additional traffic online and through your front door. Facebook and tech are cool and all, but don’t forget the power of true word of mouth. Online word of mouth will do wonders, but don’t underestimate the power of a flyer in your local Starbucks. Use the same elements you would in your online ads (awesome pictures and vivid descriptions), just put them on paper, and pin the flyer on a bulletin board. On-the-ground, old-school marketing can really go a long way. Try not to leave it out, but don’t spend days grueling over the perfect flyer. Then, voila! You’ve advertised your property as much as humanly possible. Next step? Turn on your phone ringer because it’s going to start ringing A LOT. But, be prepared that the first few days you’ll be getting calls from everyone EXCEPT prospective buyers. You’ll get investors looking to get your house for cheap, new and hungry real estate agents, and auto-dialers that will make you want to switch phones. Nonetheless, the sale must go on! If you’ve followed all the guidance we’ve given, your property WILL be noticed and sold. Your buyer is out there, don’t let the callers grind you down! When the buyers come, will you offer a Buyer’s Agent commission? More than likely, a cooperating agent (the Buyer’s agent) will be involved in your transaction and need compensation for their time and efforts. It is common for home sellers to cover this cost by offering a 2 to 3% cooperating agent commission, which you can include in your list price. This is preferred by buyers because it means they don’t have any additional out-of-pocket costs (i.e. paying a $10,000 commission to their agent), so you need to decide whether you want to offer payment for the Buyer’s Agent commission as part of your transaction. It’s typical for FSBO sellers to make statements like “Buyer’s Agents Welcome.” This will make your property appealing to real estate agents that represent buyers only. Because this is a way to get more prospective buyers in the door, offering this commission could opt you out of a whole lot of work, and even get your property sold faster. As noted by the Texas Real Estate Commission (TREC), you may even be able to get a buyer’s agent to handle the transaction as the intermediary broker. This intermediary would negotiate the transaction between you and the buyer as long as there has been consent from both parties. It boils down to the fact that, more often than not, buyers work with buyer’s agents. If you decide not to offer a commission to these agents, you’re removing a lot of eyeballs from your property. Sure, it’s possible to sell without offering a commission, but it will definitely be tougher. 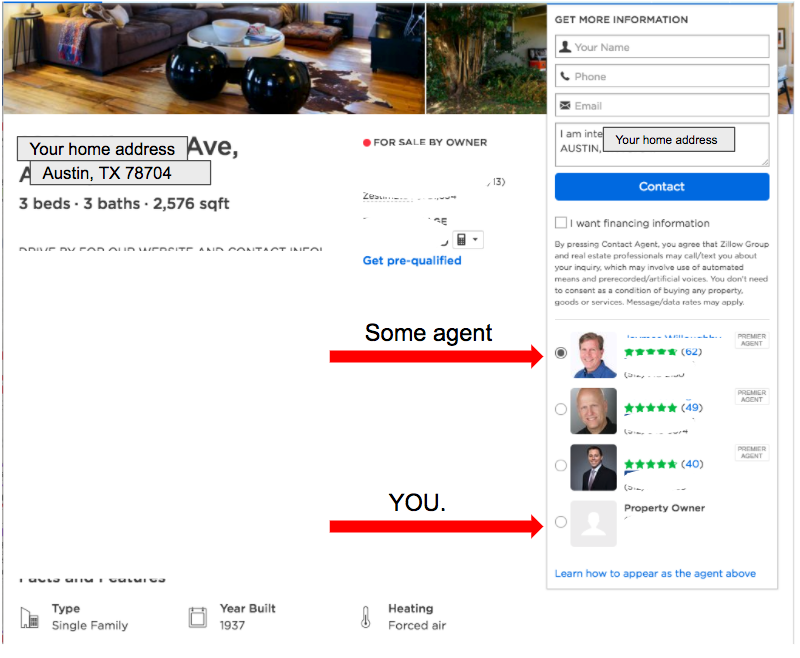 Are you offering a Buyer’s Agent commission? Do you want to utilize the Buyer’s Agent as an intermediary? To have an open house or not to have an open house… THAT is the question! Actually... It shouldn’t be a question at all because FSBO sellers are more likely to succeed if they invest in open houses. Open houses give unrepresented buyers a chance to view the property without calling the number on the sign or contacting you via Zillow. Speaking of Zillow, open houses are featured on Zillow, which means another marketing opportunity for you! Similarly, you’ll need to prepare for individual buyer showings, too! Showings will occur when a potential buyer wants to view your property outside of open house hours - possibly with or without an agent representing them. It is important that the house looks (and smells) it's best for these one-off showings as well. Make sure your dogs are put away, all the lights are on, and the window shades are open. If prospective buyers are coming through with their agent, give them space so they feel comfortable enough to envision themselves living in the house. Another great open-house practice is having flyers available that list all the upgrades and selling points of your house. Since your property wasn't listed on the MLS, it’s likely that the agent knows less about your house than the prospective buyers do. Hot tip: Use sticky notes to call out certain features of your home that were recently upgraded. The more you can call out the unique selling points of your house through flyers and creative sticky notes, the better! You’ve got offers! Are you prepared to manage them? Before anything else, YAY! Mini happy dance for you because you just received an offer! Now that you’ve mini celebrated, back to business. That’s a whole lot of paperwork, right? Stay organized. Know which forms and contracts are applicable to you and your transaction, and, equally, which ones aren’t. We strongly recommend getting proper legal assistance at this point. The in’s and out’s of closing a real estate transaction can get a little bit tricky. In reality, you should set aside some money for closing, just in case you need a lawyer. An attorney can be especially helpful for things like navigating an offer outside of the TREC approved Purchase Contract Form and receiving recommendations for a title company. When you’re so close to selling, you definitely don’t want to backtrack simply because an attorney wasn’t involved. Your real estate attorney can be a crucial part of your closing, especially when it comes to the more complicated technicalities of your real estate transaction. Furthermore, you’ll want to make sure that the buyer attached a qualification letter from a reputable mortgage lender if the offer is contingent on financing (meaning the prospective buyer isn’t paying cash). Once the legal and financial parts are out of the way, it’s time to schedule that final walkthrough and head to the closing table. Your closing will likely happen at an escrow agent’s or your attorney’s office, although this can vary. You’ll need to have all proper identification and documents (again, this is where that attorney can be SUPER useful). Be aware that sometimes lenders have last-minute document requests that you didn’t see coming. But, now that we’ve mentioned it, we hope you’ll be ready when this happens. As you’re packing up those last moving boxes, make sure that you’re aware of what non-realty items were to be included in the sale of the home per the contract. If you agreed to include things such as curtains, don’t pack them. Light fixtures, appliances, and cabinets need to stay or be replaced unless they are specific fixtures that were excluded from the contact. Last, but certainly not least, it’s time to move out! Your attorney will inform you as to when you officially need to vacate the property. This will depend on details of your specific closing and how the deed was registered. Prep for closing with your attorney - what will you need to do or bring? Cost-Benefit Analysis--do the benefits outweigh the costs? What’s the competition for your home?